Yesterday we announced we are attending Indigo 2012 with a playable demo of Cross of the Dutchman. Remember we told you to keep en eye out for our next blogpost? Well, this is it. So you’re attending Indigo 2012? Great, we’re attending as well and we’re looking forward to meeting you! Especially for the ladies and gentlemen who are coming to play our game we have cooked up a little contest. Did you hear about the novel Ate Grypstra is writing about Cross of the Dutchman? Thought about pre-ordering it but never got around to do so? 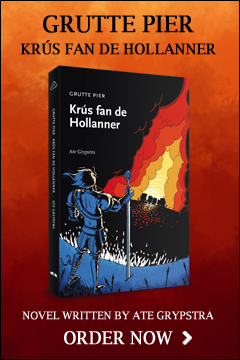 This is your chance to win one of five copies of the Cross of the Dutchman novel, autographed by writer Ate Grypstra! Share that picture with the world! The winners will be contacted to express their preferred language. The novel will be available in Frisian, Dutch and English.